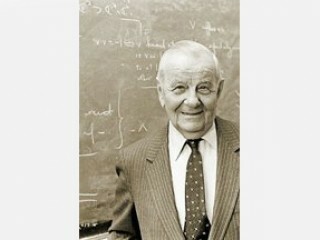 Zygmund, Antoni is a Polish-American mathematician, born in Warsaw, Ph.D. Univ. of Warsaw, 1923. In 1940 he escaped from German-controlled Poland to the United States. His work has had a pervasive influence in many fields of mathematics, particularly in mathematical analysis. He wrote over 6 books. Perhaps most important was his work with Calderón on singular integral operators. He served in a number of posts before he was appointed to the faculty at the Univ. of Chicago in 1947 and remained there until he retired in 1980. At Chicago, Zygmund created a major analysis research center. With his protégé Alberto Calderón he formulated the Calderón-Zygmund theory of singular integral operators and inspired the Calderón-Zygmund, or Chicago, school of mathematicians devoted to their study. His work in harmonic analysis has application in the theory of waves and vibrations. He also did major work in Fourier analysis and its application to partial differential equations. His book Trigonometric Series (1935) is a classic that, together with later editions, is still the definitive work on the subject. Other major works include Analytic Functions (1938) and Measure and Integral (1977).